Today I am going to show you how to setup a Maven Project with several modules including Spring Context configuration in conjunction with Tapestry 5 and Hibernate. <!-- Uncomment this to add support for file uploads: <dependency> <groupId>org.apache. Now we can add some directories for our ui application, the services and the repositories. Review the project structure image from the beginning of this post. Now we can add ther first module to our project. This will be the application containing the UI Components. Therefore we create a new Maven Project from an archetype, called org.apache.tapestry quickstart for version 5.3.3. If you dont find this archetype in your catalogs you have to define a new remote catalog. 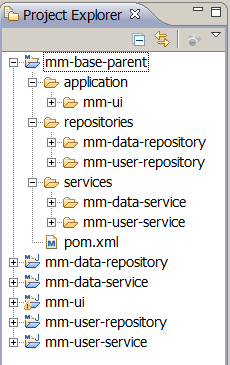 (Go to Eclipse-->Window --> Preferences --> Maven --> Archetypes --> Add remote catalog). The address to be used is http://tapestry.apache.org . The important things to notice are that we will use tapestry core, TestNG and spring-test dependencies for integration and unit testing. Furthermore we defined the dependencies for our own service modules, which we will create now. To start the whole application a jetty plugin delivers an embedded instance of the Jetty Servlet Container. This is very useful as you can start the server from within Eclipse with just a simple maven goal jetty:run. The service should only "know" the repository as dependency. Of course we need spring which comes through the tapestry-spring dependency. To use this service we have to define an API Interface and the corresponding implementation class. The main purpose of the user service is to create User and retrieve all User from a database. The User Model basically consists of an Id and a First- and Lastname attribute. The interface defines two methods. One for storing User into the database and one for retrieving all saved Users. The implementing class is marked with the @Service annotation. This is needed in order to let the UI find this class as a bean. To actually save User into the db we acquire access to the UserRepository via injecting it here. The repository modules are used to directly access datasources (databases etc.). As we also have here a template repository called DataRepository we will conecntrate on a real implementation the UserRepository. We will take advantage of an embedded hsqldb, that delivers us the needs to start coding without thinking of setting up database environments etc. Through the usage of spring-data we can just define an interface UserRepository.java that extends JpaRepository which in turn delivers us at runtime all needed CRUD operations. The interface is marked with the @Repository stereotype annotation from Spring, so that it is recognized as bean and we can inject it into other components like our UserService seen before. Now that we have all different parts we can wire up the projects with spring configurations. The repository need to access a datasource. Therefore we have to define our so called jpa-context.xml. As you can see we use an embedded HSQL db. That means we create a new in-memory databse at each application context start-up. We also define an EntityManagerFactory, that should search for all our models (currently only one: User Model) under a given package via the property "packagesToScan". The automatic generation of then entities is set via the jpa property "hibernate.hbm2ddl.auto". The Transaction Manager is mandatory, although not used in this applciation. To use the features of spring-data we have to define another context file that searches our packages for repositories. Putting it all together we define a general repo-context.xml file that imports the repositories.xml and jpa-context.xml files which can be imported by the UserService later. The service basically just tells spring to look for annotated class under the given package. It also imports the spring context we earlier defined in the repository. The application needs to get a reference to the UserService therefore we have to import the service-context. As we are using an embedded database we like to have data ready to be used at startup of the application. So we need to define here the context:component-scan that searches under the given package for our ApplicationContextListener (you can look into the attached sources for more details). Therefore we will use a special bean that listens for the spring context and inserts two Users into the database for us. Now we are ready to use the services and start coding a simple Overview Page that displays all users in a grid. As we use Tapestry we have to use their @Inject annotation in order to get the Service correctly injected. The only thing left to do is to fetch all users on page loading. So far we just have set-up the application, the services and the repositories with their maven poms and the spring contexts. Now we want to test the application. At first a simple integration test that checks whether the Service dependencies get correctly injected. This test starts the applicationContext from the UI application and checks if all dependencies are injected and not null. This test should pass. To test Tapestry pages, we can rely on the tapestry-test module which is earlier defined as dependency. You can look into the attached sources for more details. We have created a multi-module application that follows a 3-Tier Architecture. It consists of an UI Application module, two services and two repositories. For rapid development we are using an embedded HSQL database. The project setup can be used as simple template for other purposes, such as any JEE application.